Beltz, S. and Schultz, J. E. (2017). Protein Expression Protocol for an Adenylate Cyclase Anchored by a Vibrio Quorum Sensing Receptor. Bio-protocol 7(2): e2112. DOI: 10.21769/BioProtoc.2112. Beltz, S., Bassler, J. and Schultz, J. E. (2016). Regulation by the quorum sensor from Vibrio indicates a receptor function for the membrane anchors of adenylate cyclases. Elife 5: e13098. The direct regulation of a mycobacterial adenylate cyclase (Rv1625c) via exchange of its membrane anchor by the quorum sensing receptor CqsS (Vibrio harveyi) has recently been reported (Beltz et al., 2016). This protocol describes the expression and membrane preparation for these chimeric proteins. Membrane-delimited mammalian adenylate cyclases (ACs) are class IIIa ACs. Regulation is indirectly via stimulatory (or inhibitory) Gα-proteins which are released intracellularly upon extracellular stimulation of G-protein-coupled-receptors (GPCR) by first messengers. ACs generate the universal second messenger cAMP using ATP as a substrate. The size of the two hexahelical membrane domains in vertebrate ACs by far exceeds the requirements for a simple membrane anchorage. Yet, regulatory features of this intrinsic membrane anchor/receptor domain are unknown. To investigate a potential function the canonical class IIIa AC Rv1625c from Mycobacteria was chosen which can be easily expressed in bacteria (Guo et al., 2001 and 2005) in contrast to mammalian AC isoforms. We replaced the hexahelical membrane anchor of the Rv1625c AC by the receptor domain of the hexahelical quorum sensing (QS) receptor from V. harveyi, CqsS, to examine whether we can confer a direct regulation of the AC by the QS-ligand ‘cholera autoinducer-1’, CAI-1. The design of the QS-receptor and the class IIIa membrane anchors are highly similar, i.e., minimal transmembrane α-helices and exceptionally short connecting loops. We have demonstrated a direct regulation of a class IIIa AC by an extracellular signal. This considerably supports the hypothesis of a receptor function for the membrane anchor. Indeed, it raises the possibility that in addition to the well-established indirect GPCR-Gα-protein regulation of mammalian ACs a second, rather different set of signals directly impinge on this most important enzyme. Note: Expression of both plasmids is controlled by an IPTG-inducible T5 (pQE80L) or T7 (pETDuet-3) promoter. pQE80L has only one MCS. If you want to co-express a second protein from the same plasmid, pETDuet expression vectors are suitable. Note: This sequence map is generated using the program DNA5 (https://pga.mgh.harvard.edu/web_apps/web_map/start). Inoculate a flask containing 200 ml LB-medium and 200 µl ampicillin (final concentration: 100 µg/ml) with approximately 5 ml overnight culture with the desired construct (see Materials and Reagents A1. point) to an OD600 of 0.1. Incubate the culture under shaking (200 rpm) at 37 °C up to an OD600 of 0.2-0.3 (approx. 45-90 min). Lower temperature to 22 °C (shaker incubator). At an OD600 of 0.4-0.6 induce expression by 500 µM IPTG (100 µl 1 M IPTG/200 ml culture). Harvest the cells at an OD600 of 2.0-2.8 (120-150 min after induction). Collect cells at 3,200 x g for 10 min at 4 °C (Sorvall centrifuge). Add 25 ml of wash-buffer (4 °C) to the pellet, suspend by vortexing and pellet at 4,300 x g for 30 min at 4 °C (Heraeus centrifuge). Discard supernatant and store cells at -80 °C or continue with the membrane preparation. Thaw frozen cells on ice and suspend in 25 ml of lysis-buffer (4 °C) by vortexing. The cell pellet should be completely dissolved to avoid clogging the outlet of the Aminco® French Pressure Cell. Add always the cOmpleteTM EDTA-free protease inhibitor tablet just before using the lysis-buffer. Lyse cells mechanically by French press (1,100 psi) twice (Figure 2). Aminco® French Pressure Cell should be kept pre-cooled at 4 °C. Open outlet of the Aminco® French Pressure Cell such that a flow drop by drop is visible. Make sure that samples are continuously cooled in ice-water. Centrifuge homogenate for 30 min, 4 °C, 4,300 x g (Heraeus centrifuge) and discard pellet (cell debris). Transfer supernatant to an ultracentrifuge-tube and pellet membranes at 100,000 x g, 4 °C for 60 min (Beckman L-60 centrifuge). Decant supernatant, take up membranes (pellet) in 1-2 ml membrane-buffer and gently suspend in a homogenizer (Dounce Tissue Grinder). Transfer the membrane preparation into a 1.5 ml Eppendorf tube. Note: The amount of membrane-buffer to be used depends on the size of the pellet. Suspend a pellet of approximately 1 cm in diameter at the bottom of the centrifuge tube in 2 ml membrane-buffer. 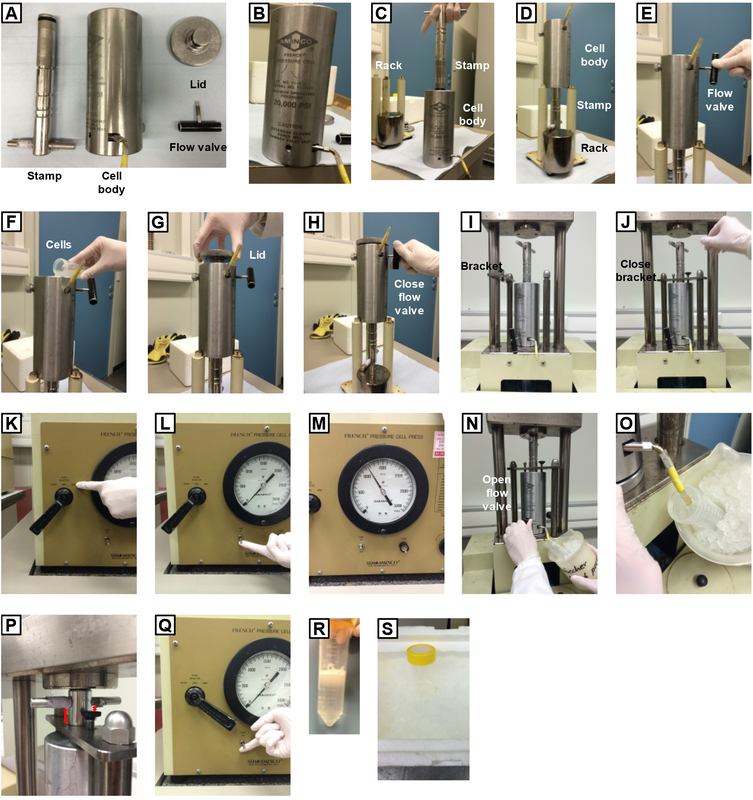 Freeze membrane preparation in liquid N2 and store at -80 °C. Figure 2. Short French press protocol. A. Equipment of the French Pressure Cell; B. Aminco French Pressure Cell (taken out of the fridge 4 °C); C. Attention! Before use: Grease the O-rings and back-up rings of the stamp with glycerol! Insert the stamp into the cell body so that the inner cell body surface is covered with glycerol as well! D. Place the cell body with the stamp upside down into the stand with the opening facing upwards. E. Place the flow valve into the hole. F. Fill in the cell solution (looks milky). G. Put the lid on top. H. Close the flow valve. I. Place the French Pressure Cell into the gadget and… (J) close the bracket. K. Start the French press by turning the hand gear on ‘high’ and (L) switch on the pump. M. When the French press set up 1,100 psi… (N) open carefully the flow valve such that… (O) a flow drop by drop is visible. P. Attention! Stop in time so you can easily open the bracket and the stamp does not hit the ground! Q. When you are done, flip the switch to ‘down’ and turn on the pump again. The hydraulic lift moves down and you can take out the French Pressure Cell. R. Your cells are lysed properly when you can see the scale through the tube. S. Put your sample back on ice for the next step. 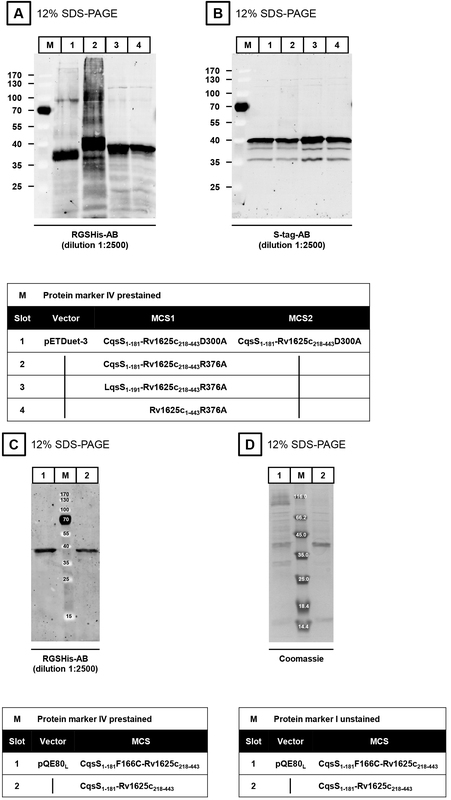 The expression of the proteins is verified by SDS-PAGE (Laemmli, 1970) and Western blot. The isolated membranes are incubated in 4x SDS-loading dye at room temperature for at least 30 min prior to application to SDS-PAGE (do not boil sample). Dilute the sample (membrane preparation) in MilliQ H2O to get 2.5-5 µg of protein in a final volume of 15 µl. Add 5 µl 4x SDS-loading dye. Load 20 µl of the mixture into one slot of the SDS-PAGE. The membranes are incubated for 1 h with each antibody (first antibody at 4 °C, second antibody at room temperature). The first antibody is either the RGSHis- (Figures 3A and 3C) or the S-tag-antibody (Figure 3B). In both cases, the ECL Plex goat-anti-mouse IgG-Cy3-antibody is used as a secondary antibody (dilution 1:2,500). Western blot evaluation is carried out using an Ettan DIGE Imager. Note: In contrast to soluble proteins, membrane proteins are NOT boiled (95 °C, 5-10 min). This work was supported by the Deutsche Forschungsgemeinschaft (SFB 766; TP B08). Guo, Y. L., Kurz, U., Schultz, A., Linder, J. U., Dittrich, D., Keller, C., Ehlers, S., Sander, P. and Schultz, J. E. (2005). 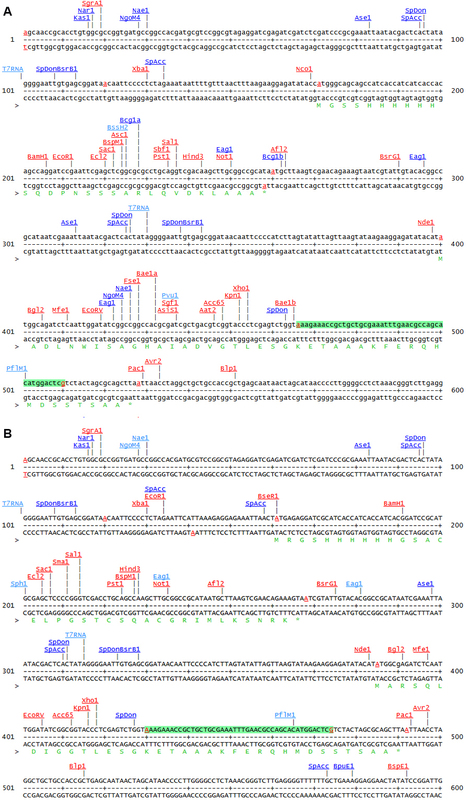 Interaction of Rv1625c, a mycobacterial class IIIa adenylyl cyclase, with a mammalian congener. Mol Microbiol 57(3): 667-677. Guo, Y. L., Seebacher, T., Kurz, U., Linder, J. U. and Schultz, J. E. (2001). Adenylyl cyclase Rv1625c of Mycobacterium tuberculosis: a progenitor of mammalian adenylyl cyclases. EMBO J 20(14): 3667-3675. Copyright Beltz and Schultz. This article is distributed under the terms of the Creative Commons Attribution License (CC BY 4.0).